I keep a copy of The Underdog Edge on my desk here at work in D.C. I find the lessons I learned reading it help in my current role raising money for the nurses. I was feeling a little burned out and discouraged when I started reading The Underdog Edge. However, I couldn’t put it down and finished it in three nights! It really encouraged me and reminded me that change is possible. The dose of motivation came at the right time. It’s required reading for anyone who leads a grassroots team or is an active team member. I’ve been on Capitol Hill and in professional association government affairs for 25 years, and Amy’s ‘Underdog Edge’ uniquely captures the spirit that makes a difference: that even in this polarized time, governments, organizations and their officials run on trust. Build trust, earn trust, and be relentlessly worthy of trust, and find two things. One is that your issue can make progress. Two is that being the fat-cat overdog ain’t all that. Amy’s book is a testament to her political and organizational acumen, but the lessons of the Underdog Edge reach much further than ballot boxes and boardrooms. No matter what your interest, industry or agenda, “upward influence” must be part of your working vocabulary. Amy’s advice and techniques are highly relevant to just about every aspect of the workplace, from career management and advancement to project funding and approval. Importantly, Amy’s book recounts concrete, inspiring, real-life stories of underdogs who overcame seemingly insurmountable odds to achieve their goals. From these anecdotes she draws clear, practical insights and lessons that are applicable in real situations. Everyone knows that if you want to open a door, you have to get someone to give you the key. The Underdog Edge demystifies and systematizes the process of upward influence with precision and care. Wow! I never expected the book to be so good. It’s a major contribution by an experienced practitioner who not only understands influence, but shows how to get powerful people on your side. Anyone engaged in influencing decision-makers should keep The Underdog Edge within easy reach. It’s clearly written and well-supported by examples and checklists. This book concentrates on what the title promises – how to succeed as an underdog. It moves from research to reality with remarkable ease. Even against all odds you can make a difference. “The Underdog Edge:How Ordinary People Can Change the Minds of the Powerful…and, Live to Tell About It” is a guide to making a difference when your particular interest isn’t the juggernaut of business changing. From creating credibility as the underdog, showing just enough passion but not too much, activism that works, and how to make one’s influence work. “The Underdog Edge” is worth considering for any business leader who wants to make their business work well against the odds. Are you or have you ever been an “Underdog?” Before I start sounding dangerously like Senator Joe McCarthy I will explain why I ask this question. If you have ever tried to sell an idea, apply for a bank loan, argue for a cause or start up a campaign on behalf of yourself or others then at certain points you have acquired that unenviable status. There are always going to be under most circumstances people who are going to be more powerful than you, the Top Dog, so to speak. Amy Showalter’s book is an exercise in identifying the strategies and mindsets that can enable the “underdog” to use this status to his or her advantage and to win. Showalter proceeds from the premise that everyone loves an Underdog if the person shows grit, commitment and determination to overcome the obstacles to the cause. Whilst using this status to one’s advantage it must never be openly exploited by the protagonist as a badge of honor or primary identity,as the illustration of how it backfired against Hilary Clinton shows, below. Reflecting her professional background, Showalter concentrates on political, social and economic campaigns of the disadvantaged individuals and communities whether through, color, race, gender or economic background to illustrate how these essential qualities lead to success. She also demonstrates how these qualities can be consciously and constructively used, and how misused they can end up making a campaigner appear stupid and disingenuous. She gives an example of the campaigns of Barack Obama ad Hilary Clinton in seeking the Democrat nomination in their efforts to out underdog each other, with Clinton ruining her cause when it was revealed how much she spent on entertaining and molly-coddling her campaign team. No, Underdogs need to be armed with the right combination of passion, grit and know-how in order to attract the attention of the Over Dog who needs to flatter his or her ego as someone who is sensitive to the “little guy”. Technique as ever is the ingredient for success and without it the cause can be overlooked or marginalized. This slight parody is not a critique of the author who clearly operates in the world of real “gritty” politics. In fact it is a very good book for anyone who needs to fulfill their community’s goals from a weak base and such approaches should not be entirely limited to the entrepreneurs of this world whose main purpose is to make themselves rich. The book is excellently designed with summaries for revision at the end of each chapter emphasizing that this is as much a training tool as it is a straight read. 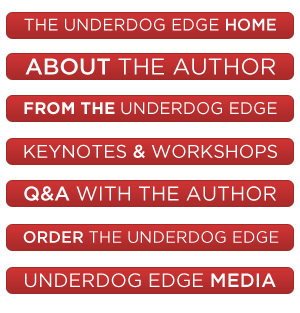 The Underdog Edge shows you the psychology behind why certain underdogs are successful in championing their cause, whether it be a business person, sports figure or politician. Showalter, who has very impressive credentials in coaching organizations on the principles of persuasion, breaks down the traits and approaches that are necessary in order to get through to the “top dogs” as she calls them – in other words, the people who hold the keys to making the decisions. Many success stories, citing specific examples, are used in each chapter to illustrate how the various techniques worked. I thought this book was well thought-out, well executed and chock-full of helpful information, with a flourish of humor and very candid quotes from her interview subjects. Though the people Showalter features in her book are typically fighting for larger issues, than, say, asking your boss for a raise, I think the same principles can be applied. There are certainly things I could draw upon for use in my work life in how to better deal with management when trying to advocate for an idea. There are SO many case studies and examples, particularly from the political world, that I have to admit a skipped a few of them. I was much more interested in the psychology of the different principles. I think this is a book you specifically seek out when you have a cause to champion, but that being said, I took away some food for thought on how to approach certain people. And I’ll try to look past the fact that the author is an ardent Ohio State fan.